I would like you all to meet this adorable but absolutely adorable boy. This is Axel, Axel is great with kids, dogs, and with pretty much everyone. He’s not so much into cats, because let’s face it, cats are weird, but other than that, he walks great on a leash and is potty trained. Axel does not like being confined so unfortunately crates are a no-no. 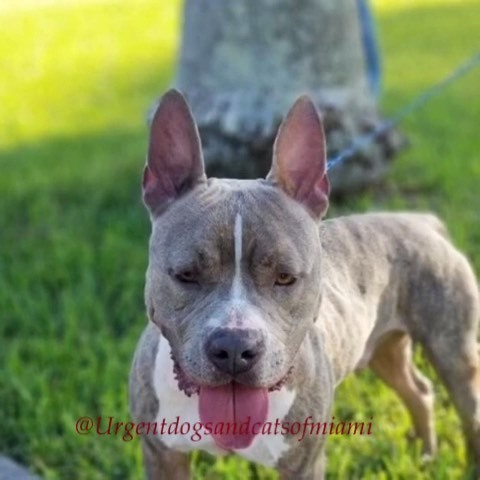 The person who adopts him has to understand a dog, is a dog, and shoes and well pretty much anything left in his way will be his to chew and play with. Axel #A1965807, is a neutered male brown tiger and white American Bulldog mix, approximately 2 years old and weighs 67 pounds. He was surrendered by his owner, but her circumstances are understandable. She was kind enough to provide us all these pictures to demonstrate to you all, what a PERFECT boy he is, therefore he deserves an equally perfect home to match. Thank you to his previous adopter, for sharing. Now it’s our turn to help him find what he’s looking for.. a great Home! At the shelter he’s scared, but out of that environment he flourishes. .